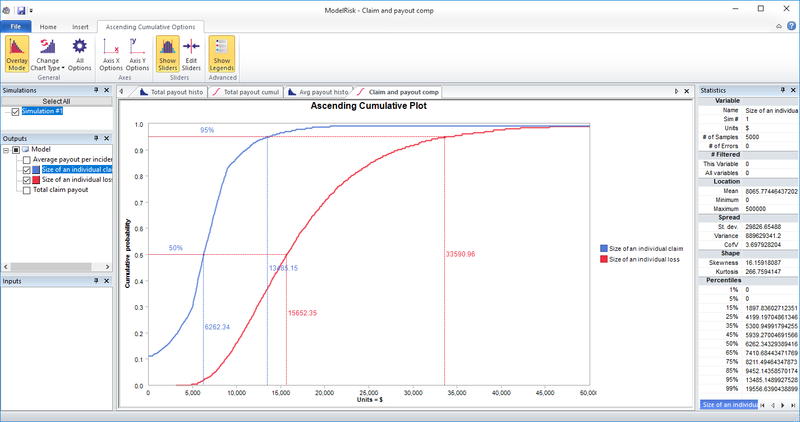 This is a more sophisticated model to determine the probability distribution of the estimated amount an insurer will need to pay in aggregate to policy holders of a particular policy over the next year. 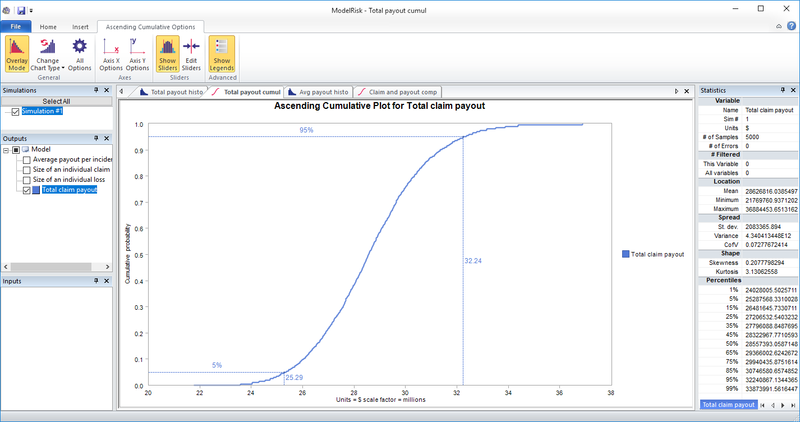 The model uses one of several special insurance risk modeling tools available in the Complete Edition of ModelRisk. 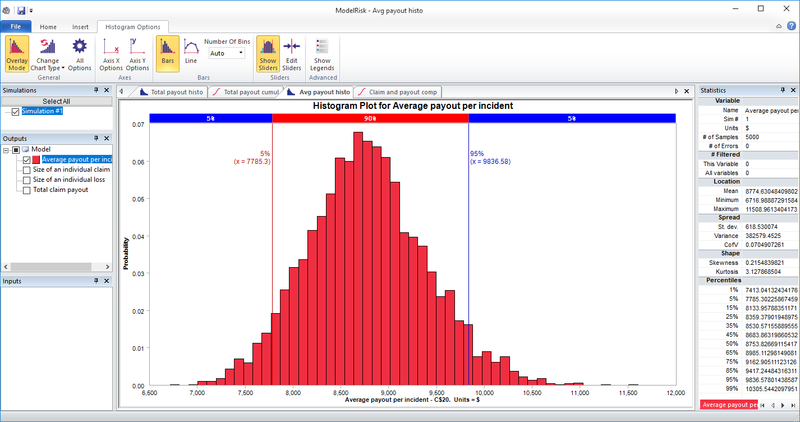 The magnitude of a random financial loss to a policy holder is assumed for this model to follow a Lognormal distribution, though one could use any other distribution. 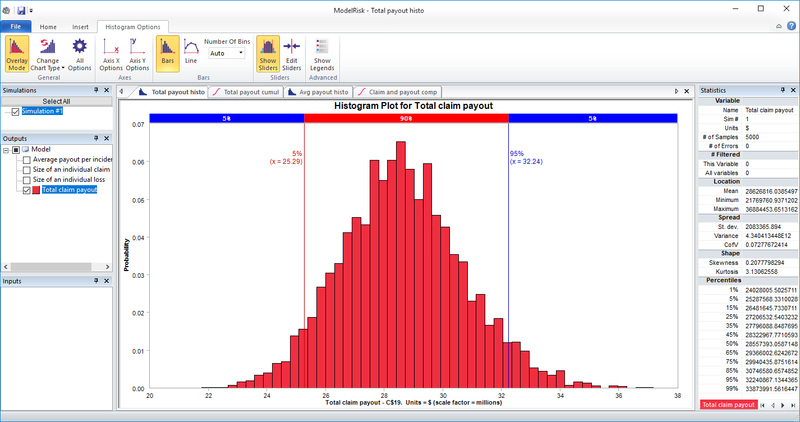 ModelRisk has twenty or so distributions that may be suitable, and which can all be fit to data. For unusually distributed data one could also use one of ModelRisk’s non-parametric distributions. The distribution is entered as an Object (Cell C9). There is a deductible of $5,000 and a maximum payout of $50,000. The insurer will challenge the claim for ny damage exceeding $15,000, with an 8% probability of the challenge failing. In the formula, #1 refers to the first listed variable (a Lognormal(17500,8600), which is the damage size), and #2 refers to the second listed variable (a Bernoulli(0.8), which returns a 1 when the claim fails, and a 0 when it succeeds). The model takes about 120 seconds to run 5,000 samples. 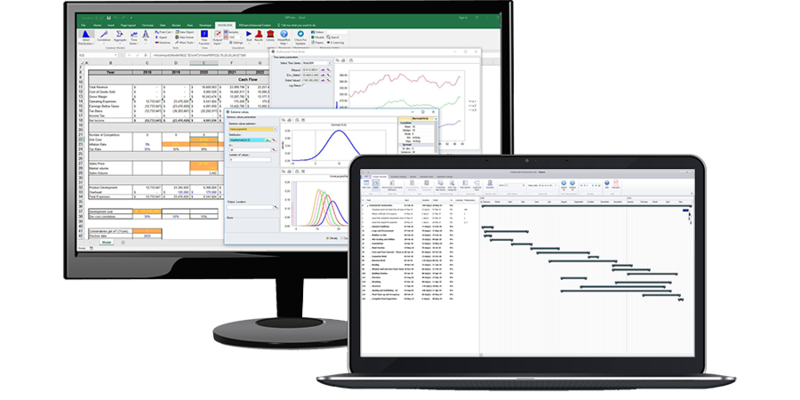 It is set up to directly show four reports within the ModelRisk ResultsViewer at the end of the simulation, which are described below. This shows a loss ranging from $24M to $34M, most likely around $28M. The claim is shifted to the left compared with the damage because of the deductible and the percentage payout. It also has a probability of around 12% of being zero because of the claim being challenged above a certain damage amount.